As technology develops in healthcare and new innovations are gaining ground, how can we know about future megatrends? The best way to keep track of silent signs is in technologies that are developing the fastest. What are these and what future vision can they create? GE Healthcare CEO John Flannery expects the amount of data generated by medical devices to grow fifty times by 2020. It is a huge addition to the amount of data and also causes problems with blocked nodes in hospitals. What is this data then? It is video and especially video data. On the consumer side, Netflix and Youtube-type cloud-based video services have exponentially increased the amount of mobile data online and the growth continues. The same is also the case in hospitals. Namely, GE intends to connect 500,000 imaging equipment to the cloud, open the cloud to third parties and provide development tools. And what GE does first, the others will surely follow suit as it can save $ 30 billion annually. From what type of data exactly does the cloud services consist of? It is a variety of different patient systems, data output from robotics, 3D-images produced by medical devices, and models of information produced by devices, but above all, high quality video. One must be able to use it in such a way that the processed data remains as high-quality and real-time as possible. I can say that surgeons and X-ray doctors look at the utmost high-quality picture and video material in hospitals. 3G-SDI, 12G-SDI and 4K. For example, older technology still in use with 3G-SDI is with nearly 3 Gbit/s speeds in image transfer and the future standard 12G-SDI already offers a 24 Gbit/s speed. They are way too high speeds on the grid. What about this in combination with telemedicine? The market will grow to $ 34 billion by 2020. Telemedicine brings significant cost savings. How do we know that this is all true? Dicom (Digital Imaging and Communications in Medicine) is a standard for processing, saving, printing and sending video and video material. It allows integration between medical image and video devices such as scanners, servers, workstations, network devices and PACS systems. Dicom already supports the HEVC main 10 video encoding and decoding technology. So, it is already preparing to support video recording and fast forwarding. From the link below more of what HEVC Main 10 is and what it requires http://leavcom.com/2…. The Main 10 profile allows for a bit depth of 8-bits to 10-bits per sample with 4:2:0 chroma sampling. HEVC decoders that conform to the Main 10 profile must be capable of decoding bitstreams made with the following profiles: Main and Main 10. A higher bit depth allows for a greater number of colors. 8-bits per sample allows for 256 shades per primary color (a total of 16.78 million colors) while 10-bits per sample allows for 1024 shades per primary color (a total of 1.07 billion colors). A higher bit depth allows for a smoother transition of color which resolves the problem known as color banding. The Main 10 profile allows for improved video quality since it can support video with a higher bit depth than what is supported by the Main profile. Additionally, in the Main 10 profile 8-bit video can be coded with a higher bit depth of 10-bits, which allows improved coding efficiency compared to the Main profile. Ericsson has stated that the Main 10 profile will bring the benefits of 10-bits per sample video to consumer TV. They also state that for higher resolutions there is no bit rate penalty for encoding video at 10-bits per sample. Imagination Technologies states that 10-bits per sample video will allow for larger color spaces and is required for the Rec. 2020 color space that will be used by UHDTV. They also state that the Rec. 2020 color space will drive the widespread adoption of 10-bits per sample video. In a PSNR based performance comparison released in April 2013 the Main 10 profile was compared to the Main profile using a set of 3840×2160 10-bit video sequences. The 10-bit video sequences were converted to 8-bits for the Main profile and remained at 10-bits for the Main 10 profile. The reference PSNR was based on the original 10-bit video sequences. In the performance comparison the Main 10 profile provided a 5% bit rate reduction for inter frame video coding compared to the Main profile. The performance comparison states that for the tested video sequences the Main 10 profile outperformed the Main profile. The Main 10 profile was added at the October 2012 HEVC meeting based on proposal JCTVC-K0109 which proposed that a 10-bit profile be added to HEVC for consumer applications. The proposal stated that this was to allow for improved video quality and to support the Rec. 2020 color space that has become widely used in UHDTV systems and to be able to deliver higher dynamic range and color fidelity avoiding the banding artifacts. A variety of companies supported the proposal which included ATEME, BBC, BSkyB, CISCO, DirecTV, Ericsson, Motorola Mobility, NGCodec, NHK, RAI, ST, SVT, Thomson Video Networks, Technicolor, and ViXS Systems. In the PC world, the growth of processors’ power is no longer in line with Moore’s law. Processor power, however, is growing but only a few percent and at the same time the power consumption decreases. Processor intelligence, however, increases in considerably bigger steps. The difference in Intel’s 7th generation Kaby Lake’s and 6th generation and Skylake’s CPU performance is quite small. The latest technologies of Intel architecture are in use in both generations. The most significant improvement is in the handling of video graphics, where Skylake is behind Kabyle significantly. In healthcare this is important because the amount of data produced by medical devices increases by fifteen times, which is explained by the enormous growth in the number of video data. Kaby Lake supports the latest video encoding and decoding technologies at the hardware level. 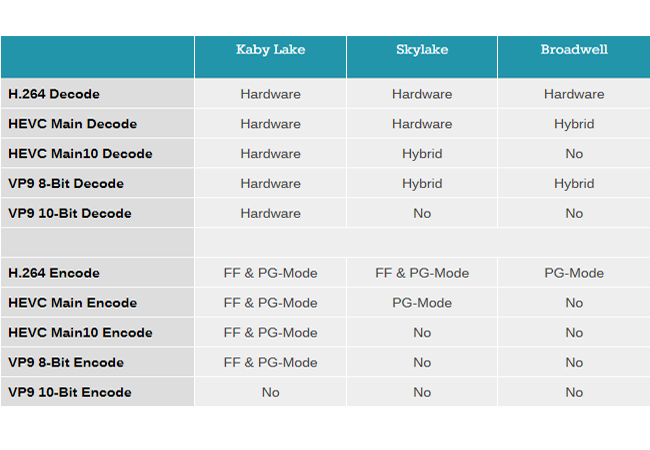 Skylake has no support at all or it is a hybrid model of hardware and software. This is reflected as a deficient reproduction of high quality video. You can watch the difference from the YouTube video below. Werth Systems is a Manufacturer of IT Solutions for the Healthcare Market. Our engineers have more than 20 years of knowledge in fanless Computerdesigns and they are specialized in developing of safe systems for the Patient Environment.